Our nationally acclaimed campground is well-known for its peaceful setting, lovely grounds, lakefront views and accommodating staff. Spacious pull-thrus & cozy furnished cabins offer something for everyone. Full service basic to luxury cabins, some sleep up to 8 people. Nice park. Restroom and shower was very dirty. While the campground is conveniently located to downtown Grapevine, the campground itself is overcrowded in sites and right in the path of Dallas International Airport. Planes going overhead morning, noon and night. The people that work at the front desk are rude to say the least. We came in from Quantha, TX and got there at 1 check in is at 2. We were told we couldn't have our spot until then. We have traveled over 30,000 and stayed at countless RV parks and this is the 1st one that told us to come back. We had to drive thru the park to get out and we saw our space available. Now if you have been to this area driving around town in a 5th wheel is impossible. There is a school up the street so we went up there and had lunch. Came back to the campground at 10 minutes to 2 and the guy looked up at the clock and said it was not 2. I requested that he look to see if our spot was available. At this point we are fuming. You also have to pay $5 for each car that comes into visit. My husband paid in advance for his cousin to come. When we found at that he was unable to make it the next day we rode our bikes down to the office to get our $5 refunded. Normally I would have let this go but because we were treated so badly at check in I wasn't going to give them anymore money. Again we were treated very, very rudely. We have stayed at this park twice, but this last time, is the last time. We get better treatment at a KOA camp. Vineyards is now off our list permanently. This is a very well kept RV park. We stayed one night. The staff was very friendly and moved us near a cabin where family had rented for the evening. Bathrooms were well kept. I did see the inside of a cabin and it was clean and looked comfortable. The roads around the park were paved to each site and grounds were kept each site had a paved area with picnic table. We would stay there again. Great "premium" sites with large green space, on waters edge. Paved roads and very clean. The Dallas - Ft Worth airport is close and the LOUDNESS of taking of jets off is almost constant. Bring ear plugs for getting a good night of sleep or be awakened at 3AM. Stayed four nights. I'd stay again if I brought ear plugs. This is a beautiful RV Park. Great destination point with a lake to swim and play in. Sites around the lake are well maintained and have plenty of space to stretch out and relax. Staff are friendly and great to talk to. We will be coming back for an extended stay next time. 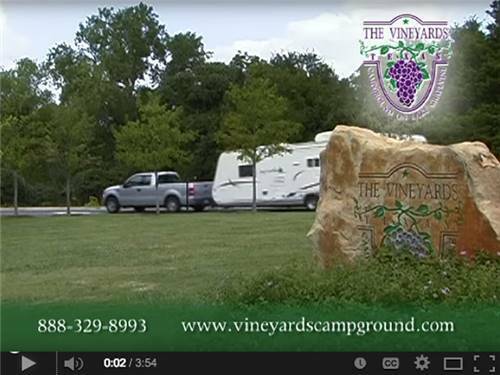 We stayed at the Vineyards to do a shake down trip since we just got our travel trailer. The campground is conveniently located in the middle of the DFW. 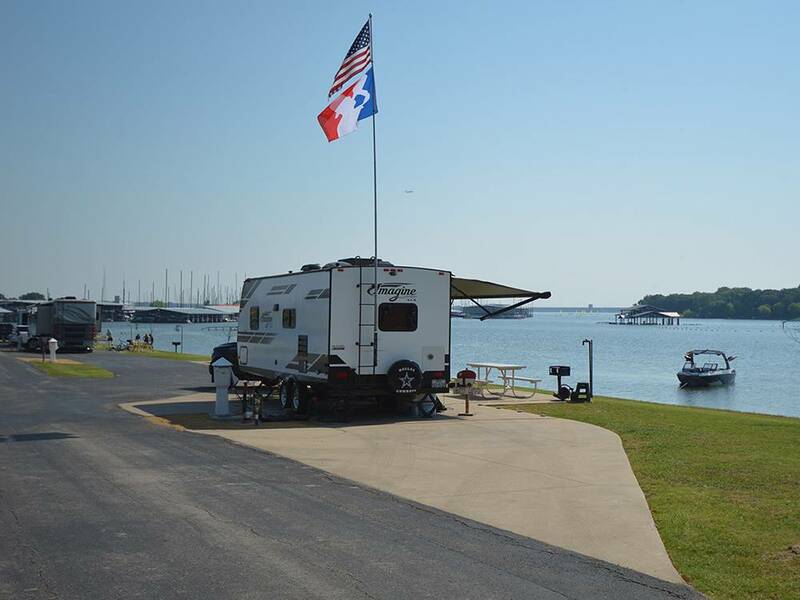 The campground is right on Lake Grapevine and very nice. Location, location, location! Great area to walk to Balboa (1 1/4mi), Corona Del Mar, Fashion Island etc. Biking paths (14mi Back Bay loop), plus over to Balboa/ferry to Penninsula and ride to Huntington. The resort itself is guard gated, with staff making their rounds to check things out. Back Bay Bistro is across the parking lot, and a small convenience store at the front of the park. I believe all sites are back in, or pull forward, with some having awesome views, and others having partial or not. We had space 3102 for a month and enjoyed it, but some spaces are tight! This was our first time backing in, and were appreciative that it was off season with minimal cars parked around the sites. We have seen this park in the high season, and it can get really crowded.....sites are pretty close. Love the vibe, and will be back. 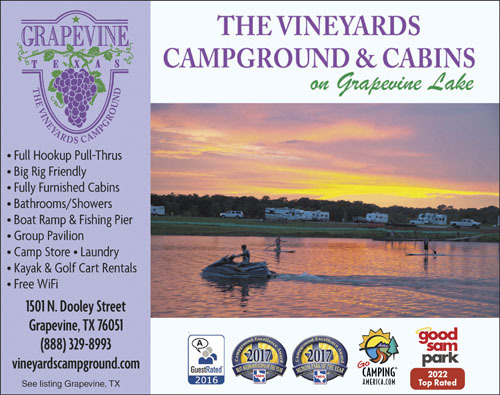 The Vineyards Campground features one of the best fishing and recreational lakes in North Texas - Grapevine Lake where you can enjoy boating, kayaking, fishing and watersports. Relax and enjoy our beautiful grounds. For those who have a different idea of 'roughing it' enjoy our fully-furnished cabins. Experience the best of outdoor recreation on the best fishing and recreational lakes in North Texas, Grapevine Lake.